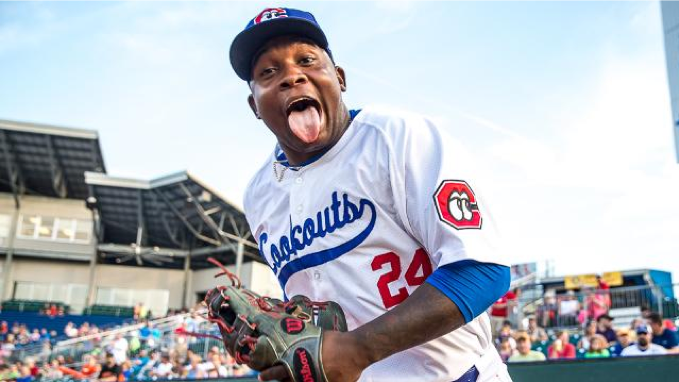 Miguel Sano, already is the subject of documentaries, including Ballplayer: Pelotero in 2012 about how this Dominican-born bambino was signed, an infamous film about the somewhat sketchy dealings between the MLB and international prospects. Born in ‘93 (after Nevermind was released! ), he is already worth half a win in WAR as a DH after a week or so in the majors. Expect him to be primarily a DH–he’s already blown out his elbow in the minors, one of the rare position players to undergo Tommy Johns surgery. While his defense is not a plus at this point, he’s a big bruiser, leading the MLB in average exit velocity at 101.64 MPH. He’s also hitting .385 – strong, powerful, ready to crush. The Twins are hangin’ in there on the Royals in the AL Central, and Sano is looking to be a huge part of their second half, if he can avoid stepping on those pesky baseballs.